Creative & Easy Halloween Decoration Ideas for Your Home! Halloween is one of the world’s oldest holidays which is celebrated in many countries worldwide. Halloween or Hallowe’en which is short of All Hallows’ evening, also called All Saints’ eve, is celebrated on 31st October every year. Halloween is celebrated by decorating homes to welcome the spirits, and various activities like disguising as evil spirits, “trick-or-treating”, scary parties, watching horror movies, attending haunted houses and much more. Give your home a spooky and devilish look by using these easy Halloween decoration ideas ! Halloween is originated in England, Ireland, and Northern France, almost 1900 years ago. It is observed for remembering the dead, which includes saints and martyrs. The celebration is done for honouring and welcoming the dead, which come to their home on this time. There are various forms in which Halloween ideas are celebrated throughout the world. In India, All Hallows’ eve is not celebrated, but Hindus remember the dead ancestors and pay homage to their souls, in the Hindu month Bhadra, during the festival of “pitru paksha”. In the United States, Halloween is the second popular festival after Christmas. Before decorating your home with Halloween ideas, it is very important to clean the house first! While cleaning you can change the arrangement of the furniture to create the desired look for the festival. The simple way to make the house look scary is to create a spooky front porch. This can be done by placing ghostly figures, writing the “Trick-or-Treat” slogan to welcome the children, and carving pumpkins. Also, a scary wreath can be attached to the door. 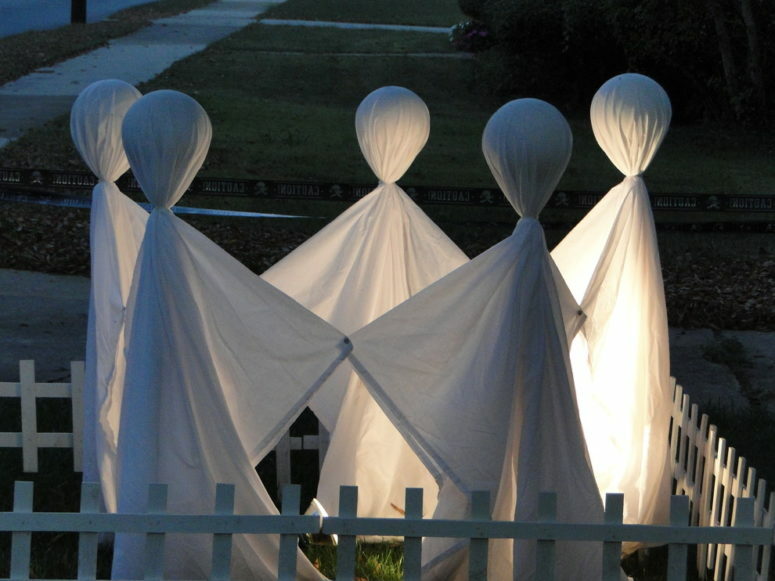 If you have a front yard, dummy ghosts can be placed in the garden to create a scary impression. It is one of the easy halloween decoration ideas to scare your guests & friends. Also, the ghosts can be illuminated at night with the help of lights spread in the grass. The front yard can be also used to create the effect of the graveyard. You can make tombstones out of cardboard tombstones, and to give real scary effect -messages can be written on it. Giving your dining table’s chairs a haunted look can be achieved by these easy Halloween decoration ideas. You can use cheesecloth or cotton gauze cloth to cover the dining chairs and make them ghost chairs. You can make your house look scarier by putting weird postures made from black cardboard on your windows and balconies. It is also the easy way for Halloween decorations, at night it will look as scary silhouettes from the home. The decoration on the walls makes your house attractive and appealing. You can decorate walls for Halloween decorations by sticking numerous bats which are made from black chart paper. You can make the wall against dining table spooky by sticking flying bats. Give your stairs a haunted look by sticking mouse made by black cardboard. 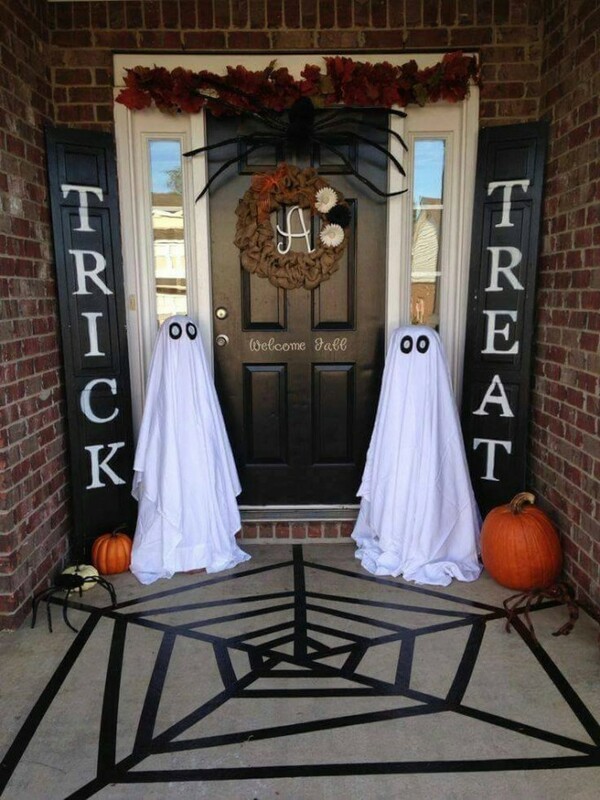 This is a very easy idea which can be done in fewer efforts and gives the correct look to your stairs in Halloween. You can also keep Jack-O-lanterns on the stairs to give more scary effect. You can illuminate your dining room by using bloody candles, which is one of the very easy Halloween decoration ideas. 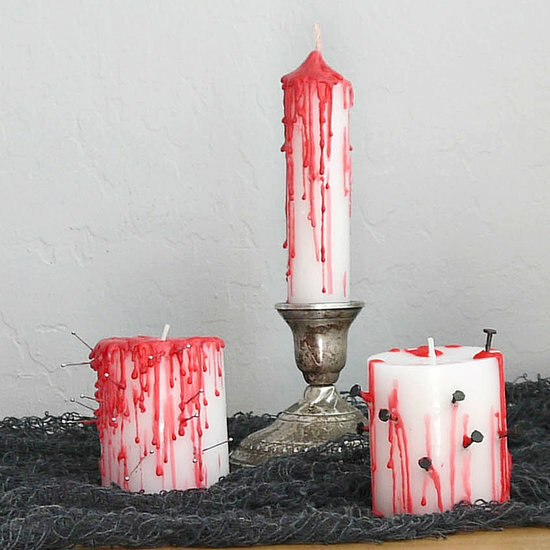 The effect of dripping blood can be easily done by using red and white wax candles. A simple way to create homemade lantern is to put a bulb in a designed glass jars. These jars can be creatively designed to give the look of monsters. This can be done using easily available materials at home like tissue papers, crayons, glues, papers and pens. “Trick-or-Treat” is a common tradition in Halloween, in which children go door-to-door, asking for candies. Thus, candy jars are placed near front doors to give candies to the children. Mummy candy jars are also one of the easy Halloween decoration ideas, which saves a lot of time and money rather than buying Halloween theme candy jars. You can make mummy candy jars using simple materials available in your house. The most popular and old tradition in Halloween is making “Jack-o-Lanterns”. It is based on the folktale of stingy jack, who succeeds in tricking evil to him a drink. You can make numerous jack-o-lanterns and place them in the front porch, in your living rooms, on the dining table, etc. You can also hang them in the lobby. You can easily get a step-by-step guide to carve a pumpkin for making jack-o-lantern. If you consider budget paper jack-o-lanterns can also be made. 15 Tips to Decorate Your Home Indoor in Christmas! Outdoor Christmas Decoration: 19 Best Ideas for Your House! Previous PostPrevious Best Practice to Check the Quality of Ceramic Tiles at the Site!